1. Stir together the vodka, sugar, cloves, cinnamon and fresh ginger in a jug and chill for up to 24 hours until the sugar has dissolved. 2. Add the infused vodka to a shaker along with the ice cubes and the vermouth and shake well together. 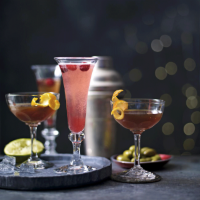 Strain into 2 small martini glasses and serve each with a twist of orange peel.